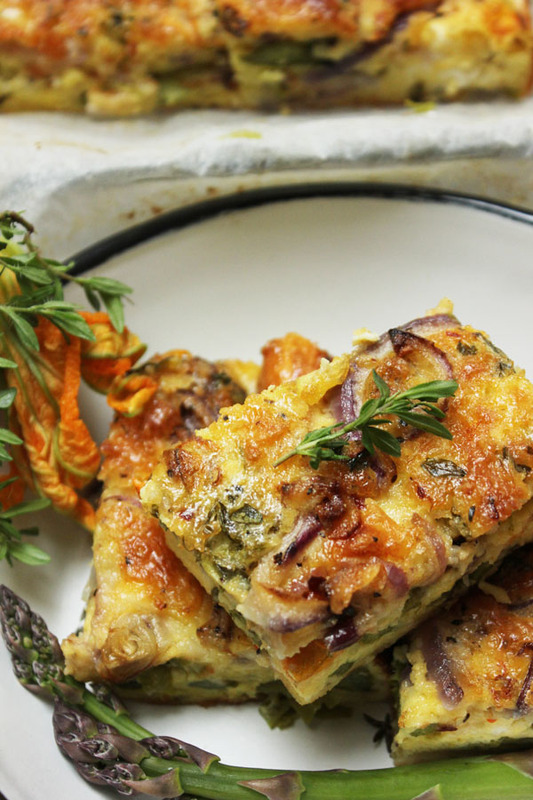 A delicious Italian vegetable traybake with cheese, fresh thyme and chilli. Prepare a baking tin 22cm x 32cm lined with silicone non-stick baking paper – traditionally this is made in a larger flat tray (swiss roll size) but I decided to go a bit deeper frittata style. Scatter the asparagus on the baking sheet. Mix the sliced onion and garlic in a spoon of oil before together scattering on top. Arrange in even but not-too-organized layer and sprinkle with chilli flakes. Crumble with feta and drizzle with a little extra virgin olive oil. Bake in the oven for 20-30 minutes until golden and puffed. Delicious served warm or cold. Great for picnics, lunches with salad or cut into cubes to serve with drinks. * If you hold the asparagus in your hand and bend it, it will break naturally where the woody part starts. If you are using very fine asparagus you won't need to do this. "When I was at a local farm shop there was a magnificent basket of newly laid duck eggs. Larger than normal and just laid, a few had to be mine. I bought half a dozen unsure where they would end up; a cake had been on the cards. With a box of courgette flowers at home, I did a little bit of research and found this delicious sounding Italian dish called scarpaccia. A vegetable traybake covered in a cheesy batter and baked with fresh thyme and chilli. Normally made with courgettes, I adapted the recipe for asparagus and used the courgette flowers too. I know these are wonderful stuffed with ricotta and fried but I am not a big fan of food cooked in oil. This bake is simple and alarmingly effective for something that is so easy to prepare. When just baked its quite delicate but it firms as it cools. Perfect for lunch with salad, for picnics or as part of a buffet. I am serving mine tonight, in small squares to go with pre-dinner drinks."